TARDIS Engagement Ring? I DO! The sound I made when I saw this terrified my husband. I want, I want, I need, I need, gimme, gimme, gimme. Apparently this is what happens when Pathetic Peripatetic gets bored. I was bored and made this. 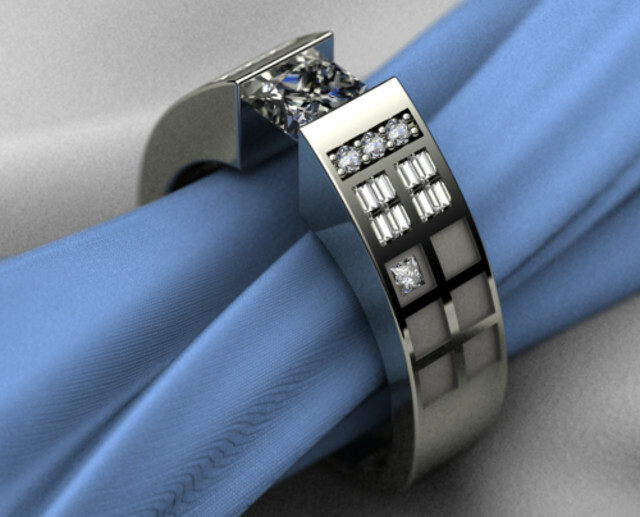 Its a Police Box based ring with a tension set 1CT Princess Cut center stone. The three round stones is the Police Box sign, the two sets of four baguettes symbolize the windows, and a small princess cut below that to symbolize the instructions found on the front of the Police Box. Posted on March 16, 2012, in Created by earthlings, TV and tagged Doctor Who, Fan creations. Bookmark the permalink. 5 Comments. What is THAT supposed to mean??!?!?? But I still WANT it!! !